The healthcare industry is way behind the rest in terms of adaptation to new technologies, especially when it comes to understanding their patients in the consumer age. But in the latest age of digitalization, hospitals have no other choice but to embrace innovations that may help them step up their game and offer better customer experience. Let’s face it, not only is itit’s crucial for increasing efficiency of the operations, but poor operations management and unsatisfied customers can also lead to big losses in revenue. The healthcare market is drastically evolving, and that evolution creates the need for medical centers and institutions to address ongoing challenges. Patients are now more similar to consumers than before. This means that hospitals need to provide amenities and services that can promote repeat business and encourage word of mouth propaganda. They can still be considered on the luxury side. Would access to Netflix or an à la carte menu be as important as transparent waiting times and better access to information? Indoor Positioning systems are able to unlock a number of use cases that enhance the patient experience and thus positively affect the patient satisfaction score. Hospitals are now offering their patients apps to help organize their visits. In the apps it is possible to manage your appointments, see an overview of the facilities, pay your bills, and even access your files. This is all builtd around augmenting the visitor/patient experience. Indoor Positioning compliments these features and opens the door to a whole new set of patient-enhancing use cases. Park your car, save the position where you have parked and navigate to your appointment all through using the app. This gives the hospital a familiar feel and stops the patient getting lost ofr stopping a hospital employee to ask for directions. There is a chance that the employee would be en route to a task and might not have the time to spare to offer directions. The patient is also able to have an overview of how long it will take to get to the appointment. This is not just the route from parking lot to appointment but can be seen from the point of departure, e.g their home, to the appointment, through combining indoor and outdoor navigation. It all starts when we accidentally forget we have a doctor appointment at all. Instead of panicking about running late, think about how great it would have been to get a quick notification in advance. But unfortunately, upon arrival, more challenges are awaiting the visitors. One of the biggest ones being wandering through big and complex hospital buildings, considering how jam-packed hospitals can get. To make any hospital visit hassle-free, Indoor Navigation and Wayfinding can help the visitors plan and manage their appointments in advance. Who wouldn’t want to give their preference to a hospital that makes it unbelievably easy to go through the process, even thinking about the customers prior to their appointments? You can also avoid running late because instead of making your way to the right room, you were actually waiting in the wrong line or strolling through a completely different department building. Pinpoint your appointment rooms on a map and simply follow the directions that will guide you to your destination. Moreover, a wayfinding app always warns the visitors if there are constructions or other obstacles on the way, which undoubtedly improves experience of those needing special assistance and saves the time of both visitors and the doctors. Equipment failures may literally cost life when it comes to hospitals. Wouldn’t it be perfect to get that weight off your shoulders and never having to worry about the risk potential faults may bring in? 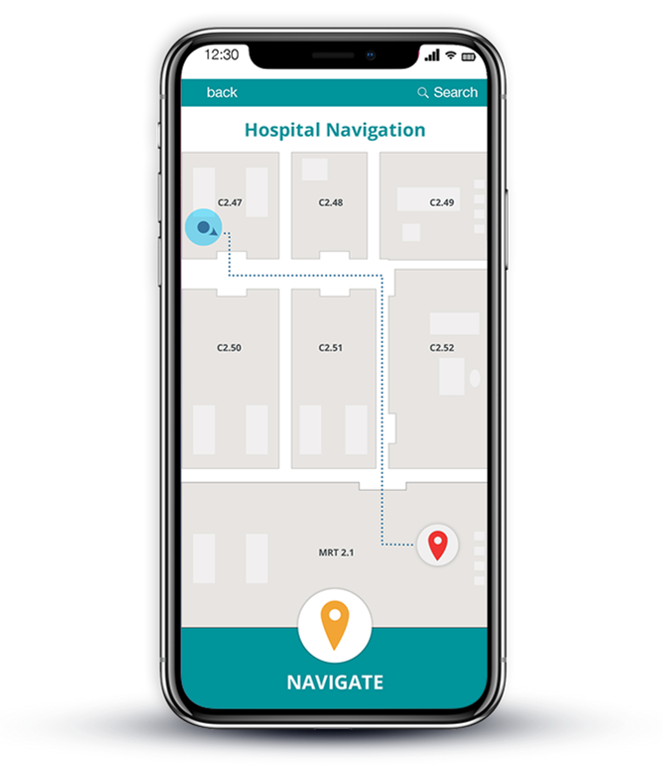 To avoid both life-threatening and operational pitfalls, implementing Asset Tracking through Indoor Navigation is one of the best things you can do for your hospital’s operation. In one click of a button, any of the employees can mark the location that needs maintenance or fixing to make it easily discoverable on the digital map. Sounds great, doesn’t it? The right professional will be notified about the fault and get it fixed immediately. Efficient employees mean happy customers. There is already too much on the plate of those helping us with our healthcare, and wasting time on answering endless clients’ questions, solving technical issues or guiding someone through the hall to their appointment room can take a lot of valuable time away from the employees’ core duties. If all the answers could be found in a navigation app, imagine what a big breath of fresh air the information desk could get without people queuing up! Long waiting times is one of the biggest concerns of those visiting the hospital. Nobody likes waiting, and especially in the era of digital transformation, customers set their expectations pretty high. Monitoring patient flow in real time can give hospitals many answers to the issues that are keeping their customers unhappy. With the data available through the navigation app, you can estimate the average waiting time per patient throughout the year and make necessary adjustments to the way appointments are scheduled. We all know parking areas are always one of the most challenging places to navigate through. But even that can be finally left behind! No more wandering around thinking where did you actually leave your car when you rushed into the hospital. Pinpoint your parking space on the Indoor Navigation map and find your way back from the appointment within a few minutes. Are you not yet convinced how Indoor Navigation and Wayfinding can bring more happy customers back to your hospital? Get in touch with us and we can tell you all about its benefits.